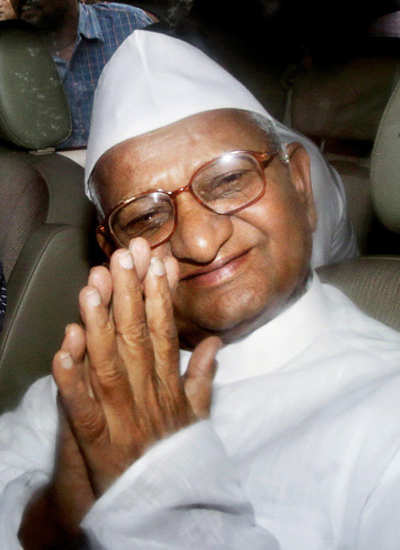 Is Anna Hazare a saviour of democracy or is he sabotaging it? This is the crucial question facing India days after it celebrated the 64th year of its independence from foreign rule. The Congress party and the government have attacked Anna Hazare and his Lokpal movement on personal and cons-titutional grounds. Referring to Team Anna as ‘A Company’, Congress spokesperson Manish Tewari accused Hazare of being “steeped in corruption from head to toe”. Tewari’s over-the-top outburst reveals just how desperate the government is to discredit Hazare and his followers and defuse the political crisis they are precipitating. The charges of corruption against Hazare – which the Gandhian has challenged his detractors to prove – are baseless. In 2005 the Sawant commission had indicted a trust headed by Hazare of having spent Rs 2.20 lakh on a birthday bash for him; a subsequent task force cleared the activist of all charges. While the Congress allegations about Hazare’s personal probity are bad, both in law and in taste, the constitutional objections raised against his agitation are more serious and involve fundamental constitutional issues. Pranab Mukherjee, among others, has described Hazare’s tactics as challenging the authority of Parliament, which is a breach of constitutional sovereignty and undermines the foundations of India’s democracy. Parliament embodies the will of the people through their duly elected representatives. If you bypass Parliament – as Hazare’s critics say he is trying to do – don’t you bypass the will of the people and subvert the basic concept of democracy, that it is a government of the people, by the people and for the people? Some years ago, commentators coined the term ‘judicial vigilantism’ to des-cribe activist judges who seemed to be overstepping their constitutional jurisdiction by intervening in legislative matters which are the constitutional prerogative of Parliament. Today – when several senior judges have been charged with corruption and bringing the judiciary within the Lokpal’s ambit is one of the points of contention between Hazare and the government – ‘judicial vigilantism’ seems like an exhibit in a museum of ancient history. But has the spirit of vigilantism manifested itself in the avatar of activists like Hazare and his followers? Critics – and these include not just those in the Congress party or in the government, but also those who while sympathetic to Hazare’s professed ideals of cleansing corruption from our society have doubts about his methods – have pointed out the danger to democracy posed by what might be called ‘ad hoc vigilantism’. Today it is Anna with his campaign against corruption. Tomorrow it could be another rebel, with or without a cause. If constitutional institutions like Parliament are bypassed how long will it be before our much-touted democracy becomes a mobocracy, presided over by demagogues with self-assumed power? Hazare and his followers would counter such arguments by declaring that what President Pratibha Patil has called the “cancer” of corruption has become so deeply and widely rooted in our constitutionally created system itself that it requires radical, extra-constitutional remedies to effect a cure. If the system itself is diseased, you have to find out-of-the-system methods of treatment. And if non-violent dissent is shackled by Anna’s peremptory arrest, how different is ‘democratic’ India from totalitarian China and its infamous Tiananmen Square? In the battle between the state and Anna, however, both sides appear to overlook a basic point. The niceties about the constitutional improprieties and the growing public anger against rampant corruption are largely confined to urban India. Concepts like the Constitution, democracy and justice remain cruel mirages in the Bharat that is rural India. Perhaps nothing exemplifies the gulf between the two Indias than the idea of the fast. In the privileged urban India of Hazare and his fans, fasting is a legitimate form of neo-Gandhian protest. In the other India, fasting is not a morally superior form of dissent; it’s a brute necessity and its name is starvation. : Team Anna on Thursday said theRamlila Maidan where Anna Hazare was to carry out his fast was not in suitable condition. “In view of conditions at Ramlila Maidan, Anna Hazare will reach the place tomorrow,” civil society member Arvind Kejriwal said. Another Hazare associate Kiran Bedi said the Gandhian will not move out of Tihar Jail till he embarks on his journey to Ramlila Maidan to launch the protest. Kejriwal, a close aide of the 73-year-old Gandhian had also said this morning that it may not be possible for Hazare to launch his protest from the Ramlila Ground today as the venue was full of muck and needs cleaning up. “I have just spoken to Commissioner of Municipal Corporation of Delhi (K S Mehra) who has promised me that a Deputy Commissioner would supervise the cleaning up operations at the Maidan,” Arvind Kejriwal said. After two nights in Tihar Jail and hard bargaining, Anna Hazare and government reached an agreement early this morning under which Delhi Police removed all restrictions and allowed him to carry out his hunger strike for a fortnight in the spacious Ramlila Maidan here. The breakthrough in the battle of attribution between the two sides came in the wee hours of the day after top aides of Hazare met Delhi Police Commissioner B K Gupta and reached an agreement. The deal marks a major climbdown from government and police’s earlier insistence that the fast would be allowed at JP Park, a smaller venue, only for three days with maximum of 5,000 protesters besides a number of other conditions. The agreement came more than 40 hours after Hazare’s arrest of Tuesday and release the same night. However, the Gandhian refused to come out of the jail, continued his fast and carried out hard negotiations from Tihar through his emissaries. Kiran Bedi had tweeted early morning that Hazare has accepted the Delhi Police offer of 15 days and announced that he will go to Ramlila Maidan after 3 pm. Bedi had earlier said that Hazare would go to Rajghat before starting his protest in the Maidan. “Delhi Police and the Anna Hazare team worked out between themselves this agreement. The Delhi Police has no problem in giving 15 days time and the 15 days also suits the Anna Team,” he said. Kejriwal said Hazare does not want to go before proper arrangements are made at the fast venue because once the crowd gather, it would be difficult to put in place proper facilities. Arrangements like erection of tents and provision of drinking water facilities were being made. He said that Hazare’s health was perfectly okay and doctors from Medanta Medicity headed by Naresh Trehan have already checked him and certified him fit. “I am fine, I am ready to walk two kilometres just now,” Hazare was quoted as saying by Kejriwal whose remarks were loudly cheered by hundreds of the Gandhian’s supporters gathered outside Tihar. Last night, Hazare refused a check up by doctors from GB Pant hospital apprehending that they may remove him from the jail on health grounds. He appealed to the government to give a chance to the Jan Lokpal draft prepared by the civil society for Parliament to discuss. “People have a right to say what draft will go to Parliament. They are supreme in democracy,” he said rejecting government’s contention that civil society cannot make the law. Meanwhile, former law minister and Hazare associate Shanti Bhushan said the decision to allow Hazare to fast for 15 days showed that his demands were reasonable and that the government should bring in a new Lokpal Bill after consulting the Gandhian. “I am very happy that ultimately good sense has prevailed on the government and it has agreed to permit Anna to fast for 14 days and that shows Anna was never unreasonable in his demands,” Bhushan said. Meanwhile, Hazare’s supporters gathered outside Tihar Jail to greet the news of government agreeing to the demands of the Gandhian. As supporters started pouring in chanting anti-corruption slogans, about 250 Delhi policemen were deployed to provide security around Tihar, while another 200 men in uniform were kept on standby. Bomb disposal teams and dog squads conducted a surprise check outside Tihar Jail here early this morning, soon after the Anna Hazare team announced that the Gandhian would move out of the prison to launch his anti-corruption protest at Ramlila Maidan. The teams descended outside the jail, where Hazare supporters were camping to express solidarity with the 73-year-old social activist, at around 3:30am and conducted a thorough check and sanitised the area. Indian anti-corruption campaigner Anna Hazare will stay in prison in New Delhi for another night so a venue where he plans to stage a public hunger strike can be prepared, according to his spokeswoman. Hazare was expected to leave Tihar prison on Thursday after agreeing a deal with authorities to restrict his fast to 15 days, prompting thousands to gather outside the prison in anticipation of his release. But a spokeswoman for Hazare’s India Against Corruption campaign said he stay in prison until Friday so the park venue where he plans to fast can be prepared for the crowds of supporters expected to attend. Hazare, 74, has been granted permission to fast at Ramlila Maidan, a popular rallying site in the heart of old Delhi. Protests swelled across India on Wednesday in support of Hazare after his arrest on Tuesday over plans to fast until death. Hundreds of his supporters were also briefly detained. Crowds outside the prison erupted at news of the deal on Thursday, shouting his name “Anna”, singing and waving the Indian flag. “Anna wanted three weeks but … has finally settled on two weeks,” Kiran Bedi, one of India’s first female police officers and a widely respected figure for her anti-graft-drive, told Times Now television. “None of us is looking at this as a victory, we are not playing games. We are doing this to move the country forward,” said Bedi, who had also been briefly arrested. Beleaguered Prime Minister Manmohan Singh and his government had appeared at a loss over how to end the standoff.The squat and slight 74-year-old Hazare fasted as thousands of his followers gathered at key locations in the capital, including outside the jail.Bedi said Indian police had agreed to look at extending permission for the hunger strike if needed after the two-week period.”We’ve seen the government retreat into a shell really and it’s come out at a very bad time for them as well; they’ve been facing a lot of flak over corruption,” said Al Jazeera’s Suri. “He certainly embodies the qualities of Mahatma Gandhi who talked about peaceful resistance; he also says this is India’s second struggle for independence. And a lot of people agree with him, they’re talking about bringing in a new revolution in this country,” said our correspondent. Consider the current session, which began on August 1. The opening day was adjourned, in keeping with traditional practice, to mourn the death between sessions of a sitting member of parliament. But the adjournment did not come before a routine courtesy greeting to the visiting Speaker of Sri Lanka’s parliament was interrupted by Tamil MPs from a regional party, who rose to their feet to shout demands for his expulsion because of his government’s behaviour towards that country’s Tamil minority. The errant MPs were rapidly silenced, and the visitor received a table-thumping welcome from the rest of the House.Every year, during India’s rainy season, there is, equally predictably, a “monsoon session” of Parliament. And, every year, there seems to be increasing debate about which is stormier – the weather or the legislature. Matters were not so swiftly resolved, however, the next day. No sooner had a newly-elected member taken his oath than a number of MPs from the Bahujan Samaj Party, which rules India’s largest state, Uttar Pradesh, stormed into the well of the House, shouting slogans and waving placards in protest against the government’s land-acquisition policies. The Speaker attempted for a few minutes to get them to return to their seats, then gave up and adjourned the session for an hour. When the MPs reassembled, the opposition members – now joined by MPs from a rival regional party – marched towards the Speaker’s desk, making even more noise. After a few more ineffectual minutes of trying to be heard above the din, the Speaker adjourned Parliament again. One more attempt was made before the House adjourned for the day, with no item of legislative business transacted. That, unfortunately, is often par for the course in India’s parliament, many of whose opposition members appear to believe that disrupting proceedings, rather than delivering a convincing argument, is the most effective way to make their points. Last winter, an entire five-week session was lost without a single day’s work, because the opposition parties united to stall the House, forcing adjournments every day. There has not been a single session in recent years in which at least some days were not lost to deliberate disruption. It wasn’t always this way. Indian politicians were initially proud of the Westminster-style parliamentary system that they adopted upon independence. India’s nationalists were determined to enjoy the democracy that their colonial rulers had denied them, and convinced themselves that the British system was best. When a future British prime minister, Clement Attlee, traveled to India as part of a constitutional commission and argued the merits of a presidential system over a parliamentary one, his Indian interlocutors reacted with horror. “It was as if,” Attlee recalled, “I had offered them margarine instead of butter”. Many of India’s new MPs – several of whom had been educated in England and observed British parliamentary traditions with admiration – reveled in the authenticity of their ways. Indian MPs still thump their desks, rather than clap their hands, in approbation. When bills are put to a vote, an affirmative call is still “aye”, rather than “yes”. An Anglophile Communist MP, Hiren Mukherjee, boasted in the 1950s that British Prime Minister Anthony Eden had commented to him that the Indian parliament was in every respect like the British one. Even for a Communist, it was a proud moment. But six decades of independence have wrought significant change, as exposure to British practices has faded and India’s natural boisterousness has reasserted itself. Some of the state assemblies in India’s federal system have already witnessed scenes of furniture upended, microphones ripped out, and slippers flung by unruly legislators, not to mention fistfights and garments torn in scuffles. While things have not yet gone so far in the national legislature, the code of conduct that is imparted to all newly-elected MPs – including injunctions against speaking out of turn, shouting slogans, waving placards, and marching into the well of the House – is routinely honored in the breach. Equally striking is the impunity with which lawmakers flout the rules that they are sworn to uphold. There was a time when misbehaviour was dealt with firmly. One of my abiding recollections from childhood was the photograph of a burly Socialist parliamentarian, Raj Narain, a former wrestler, being bodily carried out of the House by four sergeants-at-arms for shouting out of turn and disobeying the Speaker’s orders to return to his seat. But, over the years, standards have been allowed to slide, with adjournments being preferred to expulsions. Last year, five MPs in the upper house of India’s parliament were suspended for charging up to the presiding officer’s desk, wrenching his microphone and tearing up his papers. But, after a few months and some muted apologies, they were quietly reinstated. Perhaps this makes sense, for it allows the opposition some space in a system in which party-line voting determines most legislative outcomes. Four decades ago, in more genteel times, an opposition legislator once ended a debate whose outcome was a foregone conclusion, with the words, “We have the arguments. You have the votes.” Years later, the same MP, Atal Behari Vajpayee, became Prime Minister, and took pride in giving the opposition as much leeway as possible. The result is a curiously Indian institution, whose prevailing standards of behavior would not be tolerated in most parliamentary systems. In India’s Parliament, many members feel that the best way to show the strength of their feelings is to disrupt the lawmaking rather than debate the law. The Harvard economist John Kenneth Galbraith, who served under President Kennedy as US Ambassador to India, described the country as a “functioning anarchy”. We need look no further than the temple of Indian democracy to see it in action. Shashi Tharoor, a former Indian Minister of State for External Affairs and UN Under-Secretary General, is a member of India’s parliament and the author of a dozen books, including India from Midnight to the Millennium and Nehru: the Invention of India.